Our heavy duty equipment mats provide a reliable foundation for all of your operations. We have a variety of sizes and designs built to suit any site specific needs. 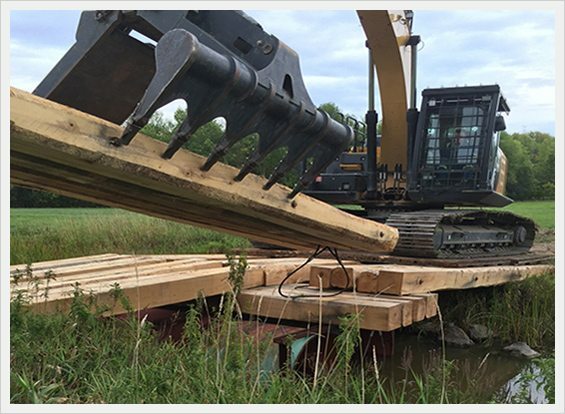 Constructed from solid wood beams, our top quality Crane, Timber and Digging Mats ensure that you can complete your job safely and efficiently. Designed and constructed for extremely easy transportation and adjustment on site, you can be sure that these mats will help you get the job done right. With optional notched or cabled ends, our heavy equipment mats are a simple task to adjust on site. Even with the ultra-heavy-duty construction, we know that operations never stay in one place, so we built our products around how our customers work.